Well that didn't take long to guess - Chris Harrison on Facebook got it first, in less than 5 minutes! We might have known you lot were too clever! So in a shock "non steam train" development we are excited to reveal that it is indeed the English Electric GT3 Gas Turbine prototype. Only 1 was built and tested as a way to see if a gas turbine with a mechanical gearbox could be an efficient replacement for steam locos. As it turned out the stop/start nature of trains didn't lend itself to the gas turbines best performance which is when it's running at a constant high speed - something that was overcome in later locomotives by converting the energy from the gas turbines into electrical power that could be stored and used at any time. Some might call it a folly, others an interesting experiment in a different kind of motive power - but as we're not restrained by fuel costs in this simulator to us it is just a lot of fun to drive something that has been gone for a long time and is unlikely to ever be seen again - I can't see this being high on any new build lists, although there is a fantastic 5" model that runs on a real gas turbine. Performance of the locomotive was never in doubt and it achieved a better time to ascend and a higher speed at the famous Shap summit than a BR Type 4 diesel and a Duchess Coronation class. The Train Simulator version will have a high detail model of the locomotive and fuel tender, a full gas turbine and gearbox simulation, working exterior features (headcode covers, lights, fan, vents, heat haze) and a full working cab with all controls active and including a complete cold start sequence. 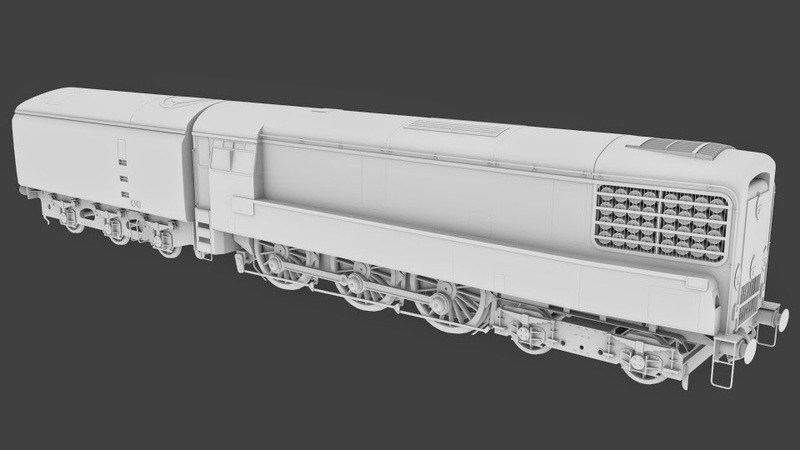 We also have to mention the custom sound set for the gas turbine with electric motor starter which will make it sound unlike anything in Train Simulator to date! Haha Woots for me getting a mention. Just such a distinctive style and shape. Look extremely forward to this. Hi, may I ask that if you mind to consider cooperate with me to produce GT3 locomotive as scale hobby model? Thanks. I'm also interested in your other British rail models. Best wishes. I am currently building a 4mm model of the GT3 and am thinking about fitting it with DCC sound. I would like to know if it would be possible to acquire the sound files for the simulator to create a sound project for the model.